Made in Japan of brass components, American Train & Track's HO-scale Tea Kettle steam loco is similar in appearance to Northern Pacific's (NP) Minnetonka prototype. 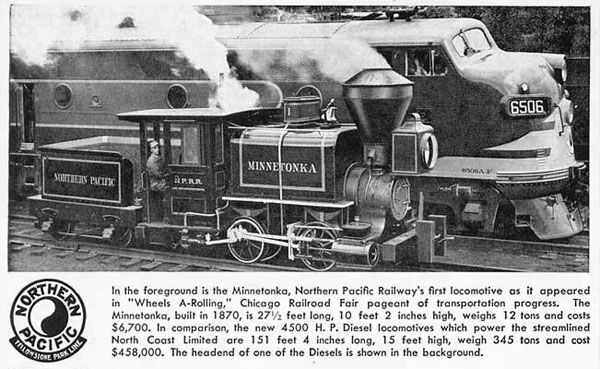 Minnetonka was reportedly NP's first locomotive. NP's Minnetonka and companion loco No. 8 were early 0-4-0 engines constructed by Porter & Smith in 1870. Below is a Northern Pacific publicity image showing its first loco with a then-new EMD F3A diesel. This American, Train & Track release sold for $14.98 during its availability around 1970.